I started working for LexTechs on January 1st, 2019 as a ASE Master/ Toyota Expert Technician. I specialize in electrical diagnoses and mechanical issues. My name is Joshua Melton; I come from a machining/fabrication/motor sports background. Even as a little kid, I had an ability to take things apart, figure out how they work, and repair or just put it back together due to curiosity alone. I spent much of my time as a child taking apart standard household appliances until I met my best friend who introduced me to cars, which I now blame for my automotive obsession. I attended Appalachian Tech and took Machine Tool Technology because I thought that making something from nothing except a raw piece of metal or plastic was really neat! I later attended Lanier Tech for Motor Vehicle Technology. Lanier tech also helped me find my first full time job in the high performance industry. I spent 3.5 years as a welder, machinist, and metal/carbon fabricator. I eventually left the fabrication industry, and due to my love of cars, found a job at a local parts store. I worked in parts for 4 years all while turning wrenches on the side. 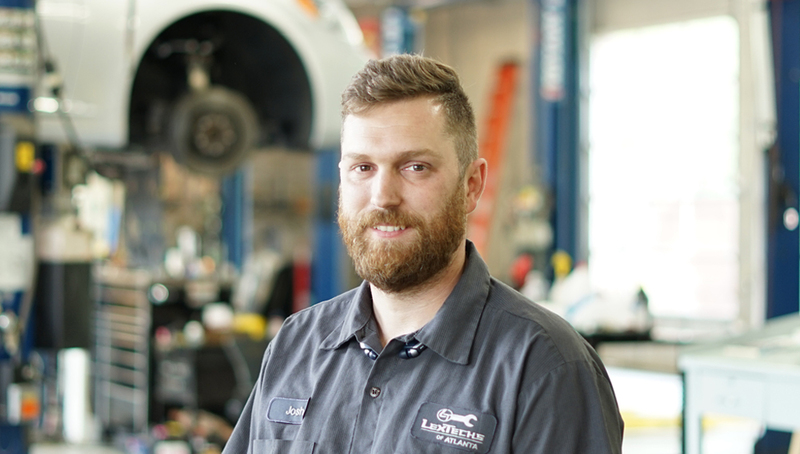 I found great success with my side work due to my real world self taught experience working on cars, and after 4 years in the retail industry, I decided to begin my career as a Lexus/Toyota Technician. I had 3 different cars when I started driving. When I turned 16 my dad bought me a 1977 Pontiac Trans AM (T/A) with a 400CI big block which was 54ci too small because, hey, opposed to popular belief, a 1977 Trans AM is a lot slower than a new mini van. The Pontiac was perfect for a 16 year old; it looks fast, sounds fast, but isn’t. This car was a beater through and through. My dad made me a deal and said he would make the car driveable, and I would have to do the rest. So, 4 tires, rebuilt carb, transmission, and full exhaust later, I had a semi-reliable car. I had to rebuild the brakes and install a new radiator as well before I could drive it any sort of distance without over heating. After driving the T/A for a couple of months and getting my but kicked by a mini van, I decided to fix the problem with a 75 HP shot of Nitrous. Still wasn’t super fast but got the job done. After I installed the Nitrous, my friends and I started calling it the flying turd because evidently brown was a popular color back then. While I was rebuilding the T/A, my parents let me use my mom’s aqua blue 1995 Jeep wrangler to drive back and forth to school. This is the Jeep I learned to drive in, stick and all. Over the years, I have a new found respect for the 1995 wrangler 4 cylinder jeep, which to this day, I will say (sorry Toyota) is the most reliable vehicle I have ever owned. I now have a jeep identical to the one I grew up with but it’s white and still kicking. About a year after I started driving, there was this little movie that came out called “The Fast and the Furious”. I soon realized that I had to have an import. I searched eBay which was pretty new, craigslist that didn’t exist, and this little magazine called auto trader before the website. I found nothing, but by a stroke of luck, one of my coworkers had a high mileage 1991 Acura Integra. It didn’t take me long to start modifying it with an exhaust, intake, suspension, rims, and of course, a big rear wing. It was a great little car that on more than one occasion, I used to race cars I had no business racing. On a more personal note, I am 34 years old, I have brown hair, brown eyes, and a beautiful red beard. I love long snow board runs down a steep mountain, and sorry girls, I’m taken by my beautiful and smart wife of six years. We do have one furry child, at lest that’s what he thinks, but we are trying for a normal naked two legged child. Over the years I have been linked to several nicknames including, but not limited to, Hot Rod, Speed Racer, Crazy, King Pin Skinny Pimp –> don’t ask me where that last one came from, but for real, I have been called that before. To this day, I love messing with my project cars. I currently own a 1988 GMC with a supercharged small block Chevy that I’m slowly turning into a drag truck. I have a 1992 Lexus LS400 that I have slammed and put a very nice fitting set of 18” rims onto. I consider it a JDM muscle car because it has a V8. Last but not least, I have a 1987 Toyota Cressida that I am In the process of installing a 2JZ inline 6 from a 1993 Lexus Gs300 with Nitrous. The list goes on but you get the picture.